watercolor on archival paper, 7.25"x5"
I recently came across this watercolor, which I had forgotten all about. I did this back in 1983 and gave to my in-laws for Christmas. This is my father-in-law, Dallas. Dal was a soft-spoken country boy from North Carolina. He moved his family to Oregon when my wife was about ten. He ran a crane unloading log trucks at the local mill for years. 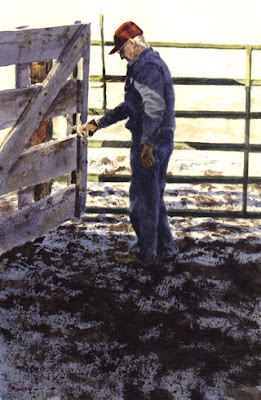 When Dallas finished his mill shift, he would come home to tend to his Black Angus cattle, prune his apple orchard, maybe work on his tractor. A small, wiry man, his movements were slow but steady, his capacity for work seemingly limitless. Dal passed away quite a few years ago. I'm posting this painting tonight because Dallas figures in the next post, and I thought people might be interested to see what he looked like. Thanks for these insightful stories of your family's history — I'm really enjoying reading them. I'll have to go through more of your memory postings You really captured "un type" as they say en français with this watercolor of your father-in-law. They don't make them like that any more. I also wanted to say how much I loved the way you captured the light against the building in yesterday's post and the sky and background landscape. Stunning. Suzanne, I appreciate your comments. We are living for the time being in Dallas' home, so many memories of him are flooding back.